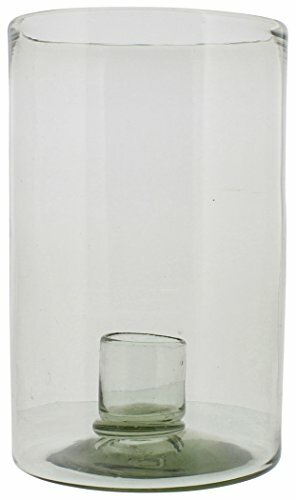 This candle holder is very pretty, with the simple and pure look of recycled glass. It has a smaller cylinder inside to hold a pillar candle, and you could even put some decorative items inside around the central candle (just be careful not to use anything flammable). Made by HomArt, this candle hurricane is 12" tall by 8" wide. The central candle holder is 2.5" wide, so that is the largest candle it could hold. If you have any questions about this product by HomArt, contact us by completing and submitting the form below. If you are looking for a specif part number, please include it with your message.